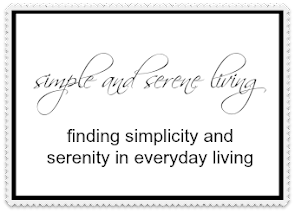 Each day as I continue on my pursuit of a simple life, I take time to just sit and allow a sense of peace to come over me. It is difficult in everyday life, these days, to not feel moments of stress and particularly so at this time of year when there are so many things vying for our attention. We are all a part of the whole, so each moment that you bring peace into your own life you will also radiate it out into the rest of the universe. it is an integral part of a simple life. P.S. It has been very gray here for the last several days and the sun is not forecast to come out until Wednesday. I am hoping that at that point I will be able to get some photos of my Christmas decorations to share with you. I'm hoping this week brings me some peace. I've been fussing too much over my decorations. So much rain hasn't helped either! Big Hugs! Peace to you Laura. Blessings to you. im so glad to have found your blog such a lovely post. I am sorry for all the bad weather you have been getting. Luckily it has missed us here in Nashville. What a great idea - I need to do this.